Despite the best efforts of the United States Department of Labor through the Mine Safety and Health Administration (MSHA) to control exposure to respirable coal mine dust, the number of Black Lung cases currently being diagnosed in Appalachia is unprecedented according to some researchers. In the decades since the passage of the 1977 Mine Act, MSHA has tried everything from new and more stringent regulations, including Lowering Miners’ Exposure to Respirable Coal Mine Dust, final rule, the use of Continuous Personal Dust Monitors and compliance assistance initiatives to eliminate the conditions that lead to the disease. 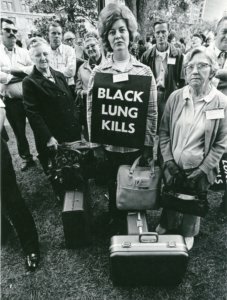 While it appeared that incidence rate had declined in the 1990’s, recent data collected by National Public Radio (NPR) after a report was released by the National Black Lung Resurgence Institute for Occupational Safety and Health (NIOSH) demonstrate a huge increase in Black Lung rates, even among younger, less experienced miners. NPR obtained data from Black Lung Clinics in Pennsylvania, West Virginia, Virginia and Ohio that shows 11 clinics reporting 962 cases since 2010. This is nearly 10 times the number of cases reported by NIOSH during the past five years. NPR also stressed that the frequency rate could be even higher because some of the 11 clinics had incomplete records and eight other clinics refused to provide any information. “This new information regarding the drastic increases in the occurrence of Black Lung Disease among miners, especially younger miners with less than 20 years underground, is alarming,” said President Roberts. “It certainly tells you there is something wrong, at least in certain segments of the industry, to allow this to occur. I applaud NPR for uncovering this information. Now we must use it to determine why this is happening and what we need to do to correct it.” As for NIOSH, they acknowledge in their report that they have missed hundreds of cases of the disease. They note the x-ray program is voluntary and only applies to working miners. They cannot compel anyone to participate in the program nor can it test laid-off or retired miners. The situation is further complicated when you consider that miners often avoid testing because of fear of retribution or job loss by their employer. Since 2011 only 17 percent of Kentucky’s active mining workforce has been tested. “This new data is extremely disappointing, but not completely surprising,” said Secretary Treasurer Scaramozzino. “The Union has been making the case for years that larger and more powerful equipment coupled with ever increasing work shifts would have a detrimental impact on miners’ health. The Union is also not buying the explanation by some in the industry that these reports reflect historical exposures.